Ashley Hollingsworth has been with Elders Real Estate Forster since 2015 and has over 23 years industry experience behind him. As a Licenced Real Estate, Stock & Station and Business Agent, Ashley has successfully sold a wide variety of properties from units and houses through to large rural holdings and everything in between. Ashley is also a Licensed Auctioneer and has successfully sold many properties at Auction. 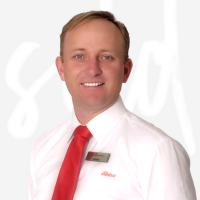 Since joining Elders Forster Ashley was placed 3rd for the highest listing agent for Elders within NSW/ACT. He was recently ranked within the top 13 sales agents in Australia and was a runner up in a National Marketing competition for his outstanding work with an Auction campaign. Ashley focuses on making great first impressions, whether introducing himself to vendors and buyers or promoting your property. You only get one opportunity to make a first impression and he aims to make all first impressions great ones. Ashley has the skills and experience to manage the marketing of your property and achieve a result you are striving for and allowing you to pursue the dreams you deserve. Ashley always put his clients’ interests first and believes that a large reason for his success is due to always being honest, contactable, and dedicated to giving a level of service that he would expect if he was a client. His long list of written testimonials is proof that he has stayed true to these beliefs. When not concentrating on Real Estate, Ashley enjoys spending time with his family either on their family beef cattle farm or along our magnificent coast. He is also kept busy with numerous sporting activities that he is involved in. Ashley is always available to discuss your sale options and would be delighted to give you a free market appraisal. If you would like to arrange a time, please phone 0447 10 77 44 or alternatively send him an email – ashley.hollingsworth@eldersrealestate.com.au. Meet some of Ashley’s happy clients. Would you like to speak to Ashley? If you’re thinking about renting or selling your property and you’d like a clearer picture of how much your property might be worth or want to have an informal chat about general property market trading conditions, Ashley will be happy to arrange a full market appraisal of your property.